There is no demonstrated benefit of high-tie versus low-tie vascular transections in low rectal cancer surgery. 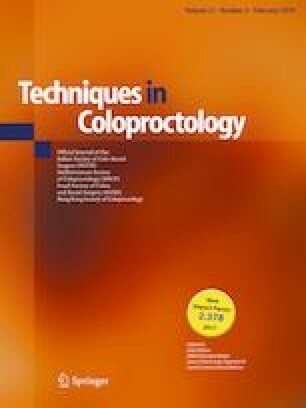 The aim of this study was to compare the effects of high tie and low tie of the inferior mesenteric artery on colonic length. This study was conducted in a surgical anatomy research laboratory. Anatomical dissections were performed on 11 human cadavers. We performed full left colonic mobilization, section of the descending-sigmoid junction, and high and low ligation of the inferior mesenteric artery. Distance from the proximal colon limb to the lower edge of the pubis symphysis was recorded after each step of vascular division. Three measurements were successively performed: before vascular section, after inferior mesenteric artery ligation, and after inferior mesenteric artery and vein section. Before vascular section, the mean distance between colonic end and lower edge of the symphysis pubis was − 1.9 ± 3.5 cm. After combined artery and vein section, the mean distance was + 10.7 ± 4.6 cm for high tie and + 1.5 ± 3 cm for low tie. A limitation of this study is the use of embalmed anatomical specimens, rather than live patients, and the small number of specimens. This study also does not evaluate colon limb vascularization or the impact of proximal lymph node dissection on survival rates. High tie of the inferior mesenteric artery at its aortic origin allows a gain of extra length of about 9 cm over low tie. Pr. Faucheron received honoraria for punctual interventions, punctual consultancies, and had some reimbursed travels, and pre-paid subscriptions for meetings from AMI, Covidien, Medtronic, Ethicon, MSD, Legrand, Takeda, and Johnson & Johnson Beauté Santé France. Drs. Girard, Trilling, Rabattu, Sage, Taton, Robert, and Chaffanjon have no conflicts of interest or financial ties to disclose.